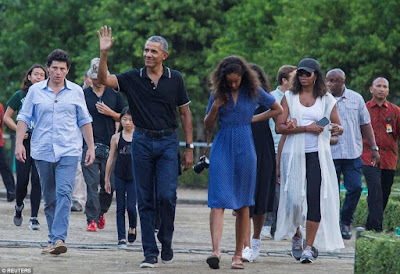 The former united state president barrack obama and his family wrapped up their vacation on Indonesia's resort island of Bali then headed to Yogyakarta where Barack lived for several years as a child when his mother, Ann Dunham, moved there for her anthropological research. Before leaving Bali, Obama and his family were seen on a river rafting on Monday. Then on Wednesday, they were all spotted sightseeing in the historic city of Yogyakarta. 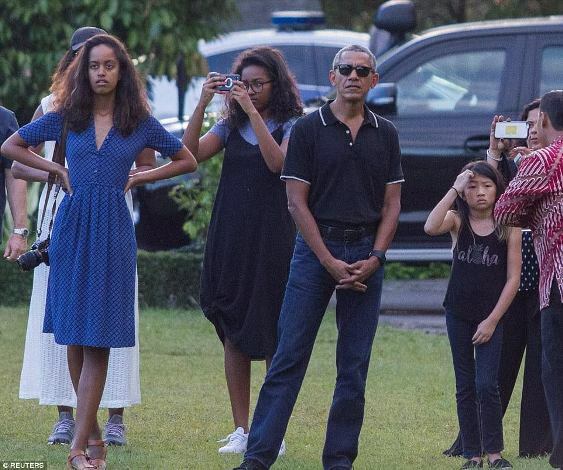 Barack, Michelle, Malia, and Sasha arrived on a private jet then drove to a luxury hotel in downtown Yogyakarta. They later went to visit the ninth-century Borobudur Temple in Magelang. A local official disclosed that about 650 Indonesian security forces were deployed to secure the family for the duration of their stay in Yogyakarta. Obama moved to Indonesia in 1967 when he was six-years-old after his divorced mother remarried an Indonesian man. After the marriage broke up, she remained there, working as an anthropologist and development aid worker, but Obama returned to Hawaii when he was 10 to live with his grandparents.